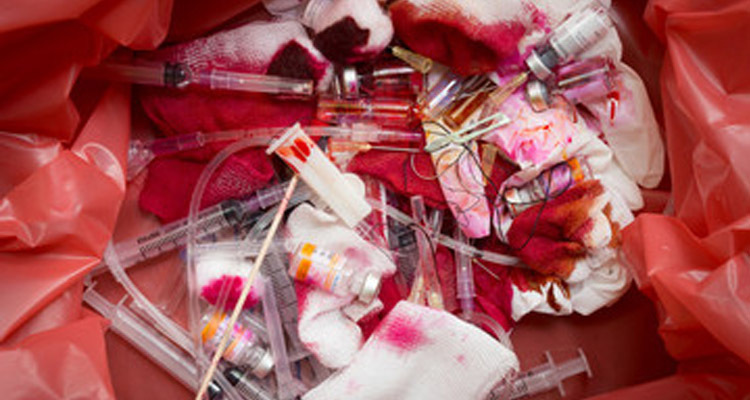 There is a category of waste that is considered non-hazardous waste but is still regulated when we talked at length about what to do with medical waste, specifically red bag waste and sharps waste. This regulated waste can actually go in the regular trash. Empty bottles, such as those that contained basic hazardous materials must be managed as hazardous waste. Although most glass waste may be disposed of as regular trash. What are the differences? The container must comprise less than 3% of the original volume to be discarded in the regular trash. Another thing is paper and plastic waste generated in a laboratory. Most of these items may be disposed of in regular waste containers. In some cases it may become necessary to dispose of paper and plastic as hazardous waste. It’s is necessary when spill cleanups or contamination with very hazardous materials. Regulated waste also includes depleted aerosol cans, food waste, non-surgical non-radioactive medical waste and packaging which result from plant production, manufacturing, or laboratory operations. Hazardous and non-hazardous waste is regulated at the state level. Therefore to make sure you’re in compliance always check with local laws. To define if you have non-hazardous material look through your safety data sheets (SDS). These documents tell you exactly what is hazardous, what chemicals are hazardous, and what’s included in products and the composition of specific materials. Make sure that it offers full-service waste management in case you’re looking to work with a hazardous waste disposal company. A full-service company will have the proper permitting, licensing and insurance to legally identify, handle, and transport many types of waste. Glycon LLC offers green, responsible and certified disposal for all hazardous waste. This includes San Diego medical waste disposal, pathological waste, and universal waste. We service all Central and Southern California areas. Call us today!